Pickup truck rentals are commonly used for home improvement projects, self-deliveries and other small loads. U-Haul pick up trucks can be used for hauling a chest of drawers or desk, mattress set, several boxes and small items or about 50 file boxes. Reserve a Pick-Up Truck Now! Cargo Van rentals are commonly used for home improvement projects, self-deliveries and other small loads. U-Haul cargo vans can be used for hauling a mattress set, Sofa, dining room set or chest of drawers, boxes and small items or about 50 file boxes. Reserve a Cargo Van Now! 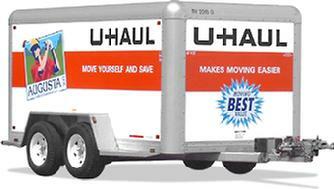 U-Haul 10ft moving trucks are perfect for studio and apartment moves as well as 1-2 bedroom moves. 10ft moving truck rentals are also commonly used for dorm or small offices moves. * no loading ramp* Reserve a 10ft Truck Now! U-Haul 15ft truck rentals have cab seating for three, and have low loading decks which make loading 50 percent easier. The 15ft U-Haul moving truck rentals are commonly used for hauling the furnishings of one bedroom apartment with refrigerator and washer/dryer, patio furniture and many boxes OR two office suites OR about 200 file boxes. *equipped with a loading ramp* Reserve a 15ft Truck Now! U-Haul 20ft trucks are equipped with a new larger-capacity van-like cab. The 20ft U-Haul moving trucks are ideal for moving the furnishings of two-bedroom apartment or small house with appliances, patio furniture and many boxes OR a vehicle or small boat OR carpet rolls and building materials. * equipped with a loading ramp * Reserve a 20ft Truck Now! The 24ft U-Haul moving truck is ideal for larger hauls such as a 3-4-bedroom home move. Many families lean toward bigger box trucks and our 24ft trucks are very popular among growing families. 24ft Moving Trucks are equipped with a towing package to tow your vehicle with ease. * equipped with a loading ramp * Reserve a 24ft Moving Truck Now! The 26ft U-Haul moving truck rental is perfect for 4+ bedroom moves. You can rent the Super Mover® moving truck with your valid driver’s license. No CDL required. The 26ft Moving Truck can Haul the furnishings of a 3-4 bedroom house with appliances, patio furniture and many boxes, garage extras and more. *equipped with a loaading ramp * Reserve a 26ft Moving Truck Now! 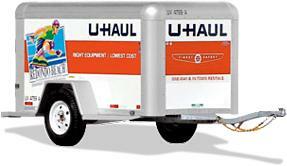 4'x8' U-Haul trailer rentals are commonly used for home improvement projects, self-deliveries and other small loads. U-Haul 4 x 8 trailers can be used for hauling a chest of drawers or desk, mattress set, several boxes and small items or about 50 file boxes. Reserve a 4'x8' Trailer Now! "The 5'x10' U-Haul cargo trailer is a perfect size enclosed trailer for smaller moves. With 230 cubic feet of space and the ability to load more than 1,500 lbs, this lightweight aluminum cargo trailer rental will meet your local or one way towing needs." Reserve a 5'x10' Cargo Now! 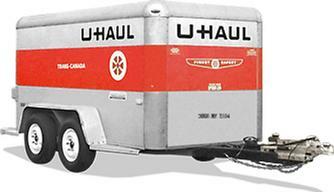 6'x12' U-Haul trailer rentals are commonly used for home improvement projects, self-deliveries and other small loads. U-Haul 6 x 8 trailers can be used for hauling a chest of drawers or desk, mattress set, several boxes and small items or about 50 file boxes. Reserve a 6'x12' Trailer Now! A U-Haul Tow Dolly option is an affordable way to tow your car. Tow dollies are lightweight and have a durable design. They also come equipped with heavy-duty security chains and ratchet tire straps for extra towing security. Reserve a Tow Dolly Now! U-Haul auto transport trailers are affordable car haulers that are ideal for long-distance moves and have a maximum load towing capacity of 5,290 lbs. They are also equipped with easy loading ramps, security chains, and ratchet-operated tire straps to transport your car safely and securely with ease. Reserve a Uhaul Auto Transport Today! STORAGE AND MORE OF CANFIELD, INC.